One of the wisest things my husband has ever taught me is “Tape is cheap.” He’s a music composer and sound designer for theatre and back in the antiquated days of analog he used a lot of reel-to-reel tape for his recordings. Basically, I think he means it’s worth the investment in tools (in his case, tape) to get the best end result possible. This little catch phrase is so applicable to other areas of life – I just recently applied it to my sewing studio. First, I invested in a sleek pair of Gingher scissors. 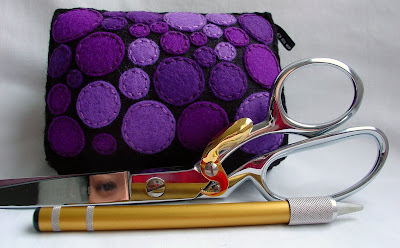 After years of hacking away with an old pair of shears, cutting and trimming is now a new-found joy. Next, I purchased a soapstone marking pencil. Now I can actually see and remove my markings without glaring sunlight and a pink eraser. Finally, I found a lovely and sizeable handmade pincushion, made by loosestring at Etsy. It’s just the right size to fit in front of my machine and it can hold pins galore. I’m finding that great tools add as much joy to the process of making things as finishing them. I have a hard time spending money on tools too. When I finally decide to quit making do I am usually so glad. Thanks also for showing your new pincushion. I hadn't seen loose string's work before. I agree about how hard it is to spend on tools, but now that I have my new scissors, I can't believe I waited so long! Loose string has so many beautiful pin cushions, I had a hard time picking!